When I make paper crafts I try to use every bit of the fancy paper I've purchased. With that philosophy floating in the back of my mind, this craft idea was born. I bought all the supplies at my local craft store--mostly in the fancy paper area. I bought a sheet each of some heavy glittery card-stock in pink, hot pink and lime green as well as a sheet of translucent paper with a printed floral pattern on it. Because I don't have die-cut equipment for cutting out letters, I found a set of pink cardboard letters (and they were on sale too). Then I headed to the ribbon section to find some coordinating ribbon in lime green and some cording in hot pink. I also picked up some flat pink lace in the inexpensive lace section of the store. I went to the dollar store for a sprig of small pink roses. The dollar store is the best place for cheap "silk" flowers that don't need to be look realistic and are perfect for hot glue crafting. But I also could have gotten those at the craft store and just paid a bit more. 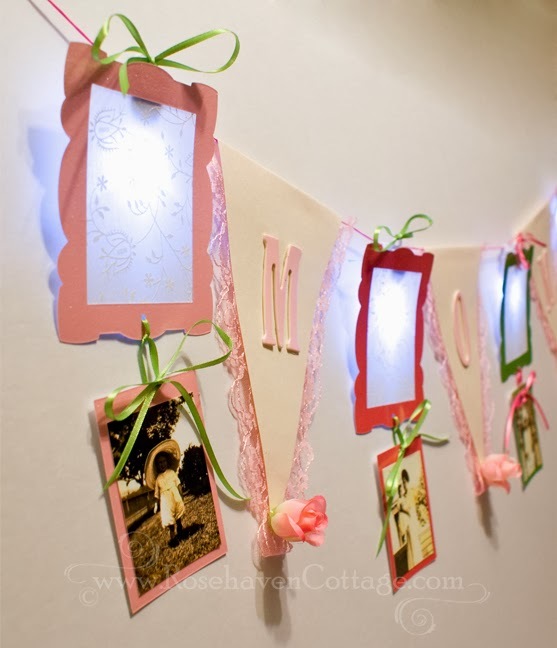 I already had some small self-contained LED lights (the kind you can submerse in water for floral arrangements) that had clips on the backs. Any LED light from the craft store will work. The clips on the backs of these made it easier for hanging on the cord once I was done. But you could hot glue hanging ribbon to any LED light you use. 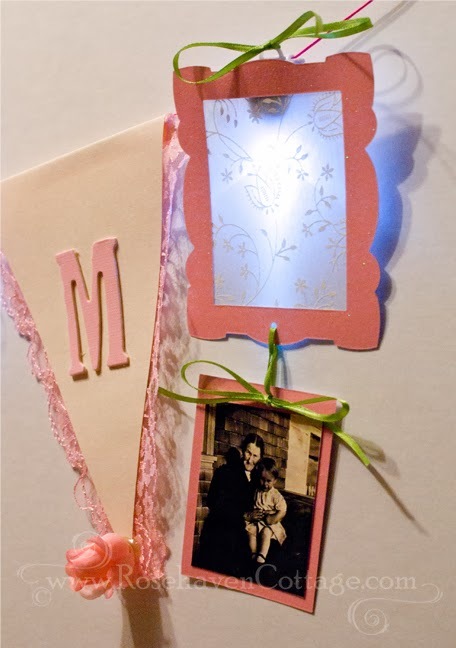 Once I gathered all my supplies, I used the Sizzix Bigz Die 654711 frame (Decorative Rectangle) to cut the frames. I had the Sizzix because of some promo pieces I was working on for them, but any frames will work (even ones cut freehand). I cut the translucent paper slightly larger than the opening in the frames and glued it and the LED light to the back of each frame. The die-cut left a rectangle of paper that was cut from the middle, so I used that to mount old family photos I'd printed on my inkjet printer on glossy photo paper. Using a small hole punch, I punched a hole in the horizontal center of the top of the mounting paper and a hole in the horizontal center of the bottom of the frame. I threaded the tiny ribbon through and tied off a simple bow to hang the photo from the bottom of the frame. I hot glued the lace and letters onto triangles I cut out of simple cream colored cardstock. I left about a 5/8 inch edge side opposite the point of each triangle to fold over the cording once I was done. I pulled the pink rosebuds from the bunch from the dollar store and hot glued one on the point of each triangle. Finally, I tied ribbons on the top of each LED light clip and folded over the tops of each triangle, folding over the 5/8" edge and gluing the fold to the back with double-sided adhesive tape. As shown, the banner spans 3.5 feet. If you choose to spell out "Mother" instead of "Mom" you can make yours even wider.